Formerly in full red levant morocco, blind-tooled, by Marguerite Duprez Lahey in 1926; now matted. Purchased by J.P. Morgan (1867-1943) in 1926. Frederick Locker-Lampson; his name written at lower part of verso (catalogue, 1886, p. 221); purchased by J. P. Morgan (1867-1943) in 1926. Ms. breviary or book of hours single leaf; illuminated in Bruges, Belgium, ca. 1500. Verso is blank with the name F. Locker written at the bottom. Artist: Gerard David, or Gerard David and another illuminator, or workshop of Gerard David. 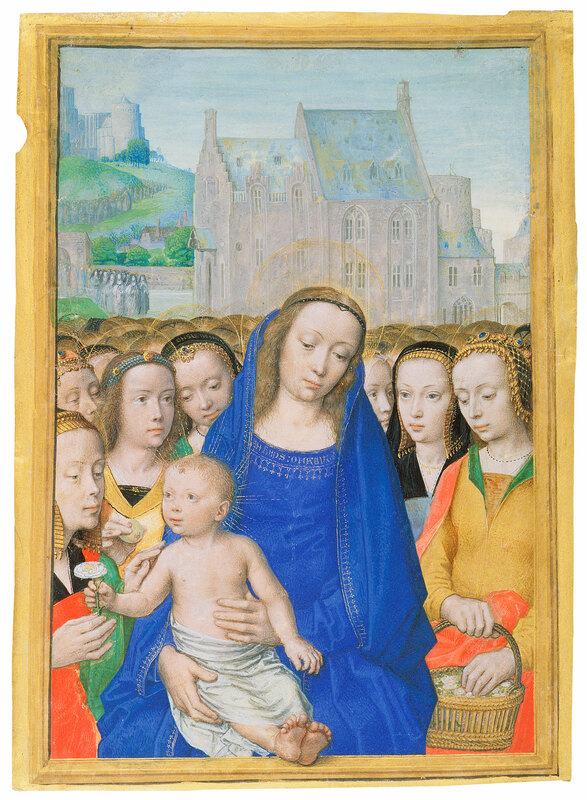 Decoration: one full-page miniature depicting the Virgin and child with female saints. This Virgo inter Virgines (The Virgin Among Virgins) was painted by the Flemish painter Gérard David about the same time he did the well-known panel of the same subject that he donated to the Carmelite Convent of Sion in 1509; both share details of style and costume. In the panel, most of the virgins have attributes, while those in the miniature do not, except for the one holding a basket of flowers, which may be Saint Dorothy. Some of the letters on the neckline of the Virgin's dress can be read as "O Maria." Three other leaves in a Breviary in the British Library have been attributed to David. This miniature once belonged to the poet Frederick Locker-Lampson (1821–1895). After Morgn acquired the leaf, following an earlier practice, Marguerite Duprez-Lahey bound it in full blind-tooled morocco.